This overview is a brief description of how to file a complaint of discrimination, harassment, and/or retaliation at The University of Austin. For additional information concerning the University policies found in this area, please contact the Office for Inclusion and Equity. What is the process for filing a complaint through the Office for Inclusion and Equity? What is the difference between a formal and an informal complaint? May I file both an informal and a formal complaint? When do I need to file a complaint? Do I have to file a complaint once I contact the Office for Inclusion and Equity? Am I protected from retaliation if I file a complaint? What is the role of the Office for Inclusion and Equity? May I file an anonymous complaint? Any person (e.g., faculty, staff, student, visitor) may report what they believe to be an act of discrimination or harassment to the Office for Inclusion and Equity as soon as possible after the alleged incident(s). Students/Faculty/Staff wishing to report concerns of harassment or discrimination should contact the Office for Inclusion and Equity, NOA 4.302; (512) 471-1849. Students with disabilities who wish to receive assistance should contact Services for Students with Disabilities (SSD) at (512) 471-6259. There is a grievance procedure administered through SSD for students who have specific complaints regarding the University’s compliance with certain provisions of the Americans with Disabilities Act of 1990 and the ADA Amendments Act of 2008. First, you should complete the OIE Data Form so that our office will be able to help you ascertain the proper course of action for filing your complaint. The form should describe the alleged incident(s) along with relevant date(s), name(s) of the respondent(s) and witnesses. The Data Form needs to be dated and signed by the complainant. You may file a complaint through the Informal Resolution Process by completing the Informal Complaint Form and e-mailing it or hand delivering it to our office. You may send e-mails to equity@utexas.edu. 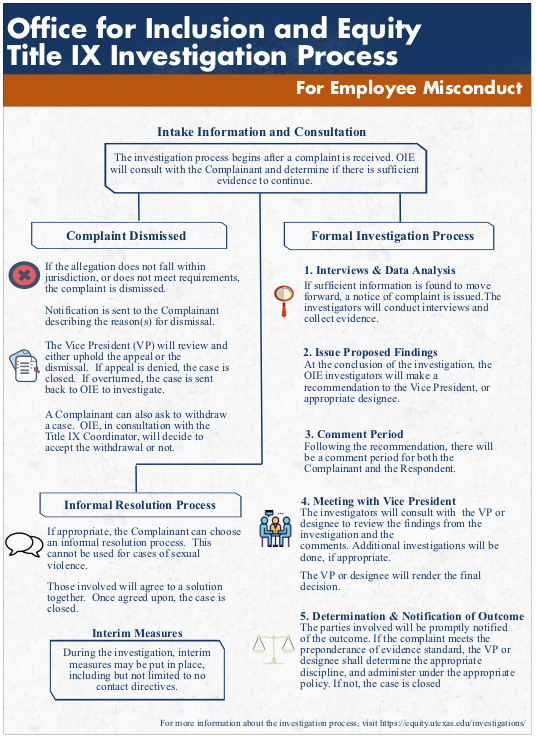 Download the OIE General Infographic.PDF or the OIE Title IX Investigative Process (only use during consultation).PDF higher resolution images. Both the informal and formal complaints are official University complaints of discrimination and/or harassment; however, there are some key distinctions between the two types of complaint processes. Informal Complaint: The goal of the informal resolution process is to give notice of a perceived wrong and have OIE informally address the situation. The University of Texas does not make a determination as to whether a respondent(s) has violated University policy. Instead, Office for Inclusion and Equity staff will use conflict resolution techniques to attempt to resolve the concern(s) brought forward. Moreover, Office for Inclusion and Equity staff members will only speak to those people whose involvement is necessary to facilitate a resolution to a complaint. At times, this might include only the complainant(s) and respondent(s). The Office for Inclusion and Equity attempts to reach a resolution to an informal complaint within thirty days of the filing of the complaint. This process is not a fact finding endeavor. No investigation is conducted. There is no discipline as part of this process. Generally, the employment or academic concern is handled if the complaint is made within 90 days of the occurrence (alleged wrongful act) or 30 days from the end of the semester for students. Formal Complaint: The goal of the formal resolution process is to reach an official determination as to whether a respondent(s) has violated one of the University’s policies, including, but not limited to, the Anti-harassment Policy and/or Nondiscrimination Policy. As part of the formal resolution process, the Office for Inclusion and Equity will investigate formal complaints of harassment, discrimination, retaliation, and/or inappropriate consensual relationships and determine whether there is more evidence than not that a policy violation has occurred. The investigation may include oral interviews and/or written statements from the complainant, the respondent, and any witnesses who may be able to provide pertinent information about the facts of the case. In the course of the investigation, the respondent will be informed of the allegation and the facts surrounding the allegations and will be afforded a full opportunity to respond to the allegations. In response to most reports of discriminatory harassment, the University will complete the investigation in 60 business days (Note: Business days do not include weekends or employee holidays as recognized by the University). However, there may be some reports that cannot be investigated within 60 business days. At the conclusion of the investigation, the complainant and respondent will be notified by the University of the Office for Inclusion and Equity’s investigative findings. Based on the investigation findings, there may be discipline and/or other measures deemed appropriate to resolve the complaint. Generally, the employment or academic concern is investigated if the complaint is made within 180 days of the occurrence (alleged wrongful act) or 30 days from the end of the semester for students (whichever is longer). The complaining party selects whether to pursue an informal or formal complaint. A complainant may choose to first file an informal complaint. If, however, the parties are unable to reach a mutually acceptable resolution of the informal complaint, a complainant may then file a formal complaint provided that the complaint is within the time limitations set out in the applicable policy. 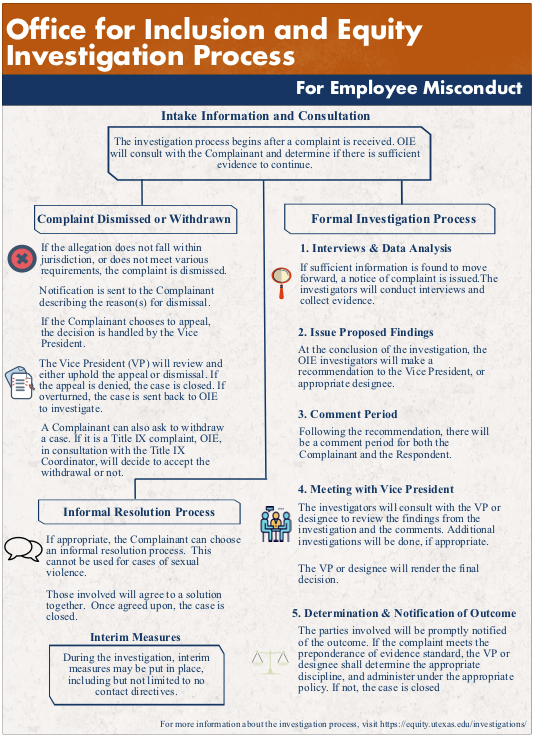 A complete description of the informal resolution process and the formal resolution process can be found in the University’s Nondiscrimination Policy, available from the Office for Inclusion Equity and can also be found by in the Complaint Process Flow Chart. Not concurrently. The informal resolution process and the formal resolution process are not mutually exclusive, but each complaint process should be used in good faith. Generally the filing of a formal complaint following the resolution of an informal complaint is appropriate after a reasonable amount of time has passed and the situation has not improved and/or circumstances have changed, including the occurrence of additional concerning conduct/behavior. Individuals wishing to report a concern or file a complaint of discrimination and/or harassment are encouraged to do so as soon as possible following the incident(s). Generally, the employment or academic concern is handled if the complaint is made within 180 days of the occurrence (alleged wrongful act) or 30 days from the end of the semester for students (whichever time period is longer). Any member of the University community may consult the Office for Inclusion and Equity without obligation to file a complaint. Office for Inclusion and Equity staff will give University community members information designed to explain the University’s policies and procedures so that they may make an informed choice as to whether they would like to file a complaint. In certain limited situations, however, the information learned by the Office for Inclusion and Equity may be of sufficient concern that the University must take appropriate action to resolve the concern even though an individual does not wish to file a complaint. An example would be if an individual could be harmed if they return to the environment described or the situation described poses a risk to others. Complaints of discrimination and/or harassment are treated with the greatest degree of confidentiality possible. In all situations, confidentiality is maintained on a need-to-know basis; however, confidentiality can only be respected insofar as it does not interfere with the University’s obligation to investigate allegations of misconduct that require it to take corrective action. The University prohibits retaliation against individuals who have opposed discriminatory/harassing conduct; participated in investigations; and/or requested accommodations. Retaliatory action is regarded as a basis for a separate complaint under the University’s procedures. If you believe that you have been retaliated against for oppossing discriminatory/harassing conduct, or for participating in a discrimination/harassment investigation, or for requesting reasonable accommodation or religous accomodation, you should contact the Office for Inclusion and Equity. The Office for Inclusion and Equity is an administrative office, not a judicial or legal office. One of its roles is to assist campus community members in understanding the University’s policies and procedures in the area of discrimination and harassment and to assist in resolving complaints of discrimination and harassment. Office for Inclusion and Equity staff members are impartial administrators who are neither advocates nor adversaries with respect to the parties and witnesses in a complaint-related matter. Instead, Office for Inclusion and Equity staff members are advocates for the proper and fair administration of the complaint process. If you have a concern that you wish to report anonymously, you may do so on the University’s Compliance Hotline www.reportlineweb.com/utaustin or 1-877-507-7321. If you choose not to provide contact information, the form will be submitted anonymously. Please note however, in many cases, a more effective response to the incident can be implemented if University staff has an opportunity to ask follow-up questions if necessary. The Office for Inclusion and Equity can further explain the University’s policies and procedures to you and can assist in initiating the complaint process. To make an appointment, please call (512) 471-1849. Office hours are 8:00 a.m. to 5:00 p.m., Monday through Friday.